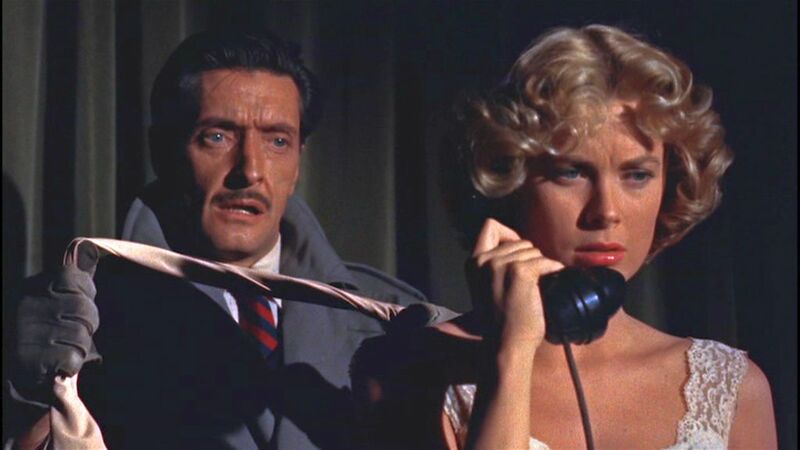 Dial M for Murder was a color film, which required more lighting and offered less contrast than black-and-white. At that time television was still black-and-white. It was filmed for 3-D viewing (3-D cameras were bulky and hard to move). In the event, though, there wasn’t much material in the film that could really take advantage of 3-D effects; and with the popular interest in 3-D movies on the wane at the time of the film’s release, the film was mostly shown in 2-D format. In addition, it was also filmed in Cinemascope, and the widescreen format introduced image-framing issues. 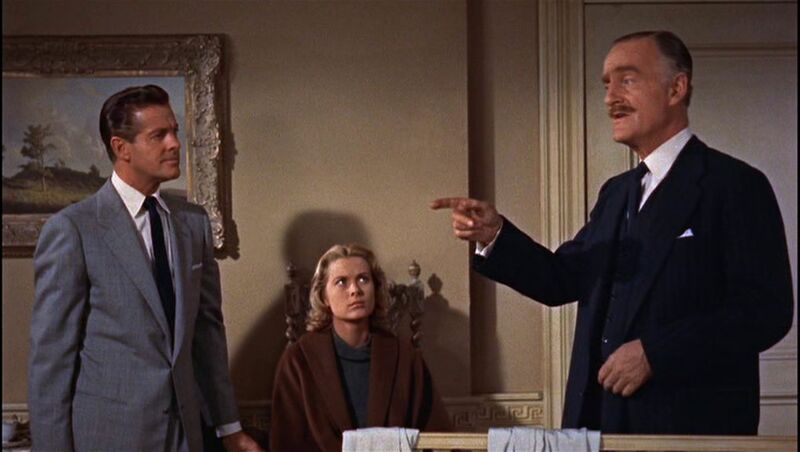 These issues were compounded, because of the tight space in which Hitchcock was filming – the entire film is essentially a resurrection of a famous stage play that takes place within the confines of a single apartment room. Note however that shooting film in a confined action space was something that Hitchcock, the master of cinematic narrative expression, did not shy away from – he also did it with Lifeboat (1944), Rope (1948), and Rear Window (1954). 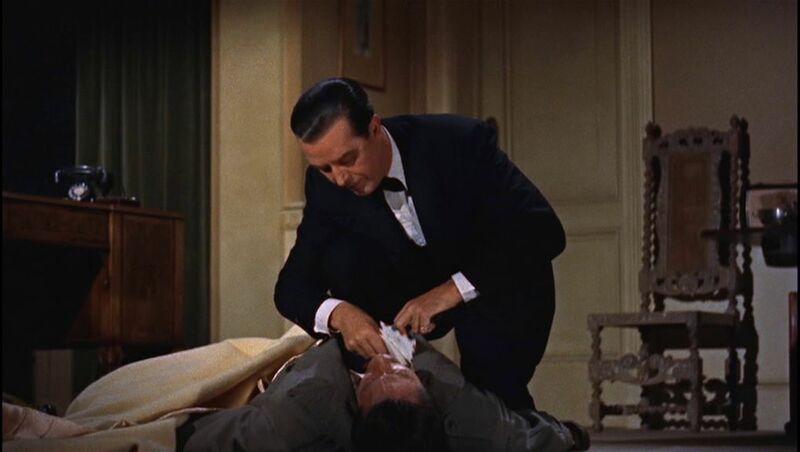 The stage play on which the film was based, also named Dial M for Murder, was by Frederick Knott (who also scripted the film), and it had been a recent hit when it opened in 1952 on London’s West End and New York’s Broadway. In the usual case when stage plays are made into films, the film director often “opens up” the action by portraying various action scenes in their referenced locations. 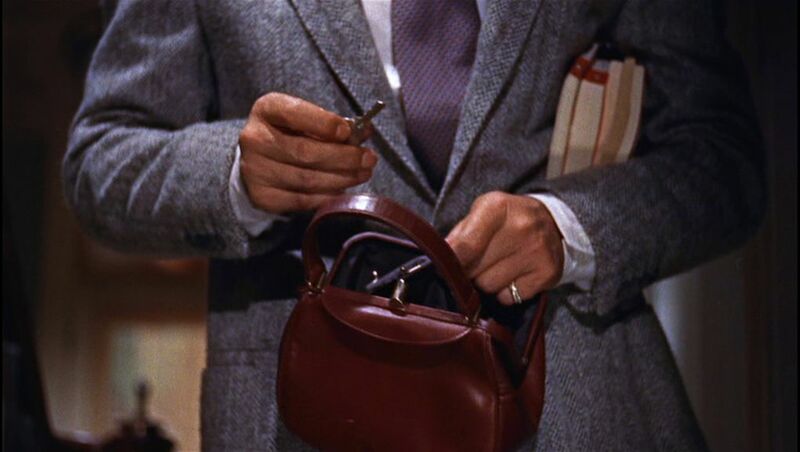 However, for various reasons – perhaps the play’s recent vintage or perhaps factors associated with the drama’s tight narrative – Hitchcock decided not to open up Dial M for Murder in this way, so he was left with the confining production constraints that I have just mentioned. (In fact even two of the key characters in the film are played by actors who played the same roles in the earlier stage production.) Nevertheless, and despite these limitations, he did manage to come up with a dynamic cinematic narrative, as noted film scholar David Bordwell has carefully pointed out . The story of Dial M for Murder concerns a husband’s plan and attempt to have his wife murdered by a hired assailant. The viewer sees things mostly from the husband’s point of view, and this guilt-inducing empathy for the villain is probably one of the movie’s attractions. The narrative passes through four stages, the first two of which are separated from the remaining two by an “intermission”. 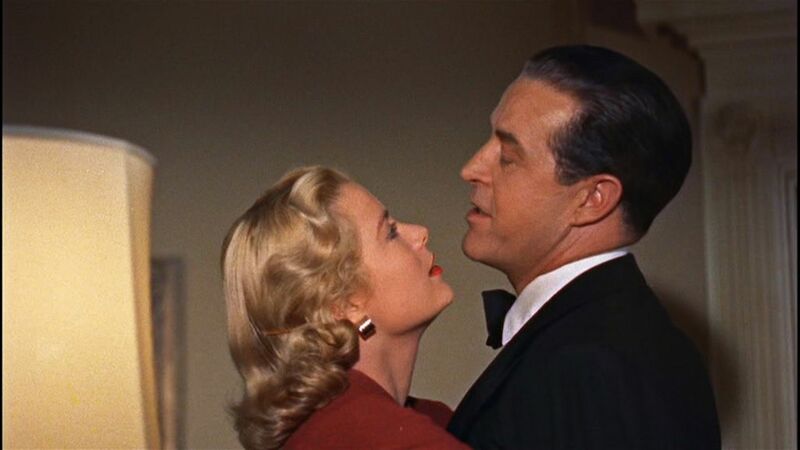 In the beginning, recently retired tennis professional Tony Wendice (played by Ray Milland) and his wife Margot (played by Hitchcock favorite Grace Kelly) are shown apparently living in happy matrimony in London. The arrival from America of well-known murder mystery writer Mark Halliday (Robert Cummings), with whom Margot had a passionate love affair a year earlier, disrupts things. Margot tells Mark that she wants to break off their illicit relationship, but there is still a problem: one of the love letters that Mark sent to her was stolen from her handbag and she has received blackmail threats about the letter from the unknown thief. She doesn’t want Tony to find out about her relationship with Mark, and she doesn’t know what to do. Tony, however, knows all about their relationship and was himself the letter thief. While Mark and Margot are out, Tony meets with a former college schoolmate, C. A. Swann (Anthony Dawson, who played the role in the Broadway production) who has fallen onto swindling ways and is desperate for money. Tony offers him £1,000 (about US$25,000 today) to murder his wife the very next night, when he and Mark will be away attending a stag party. This circuitous 22-minute conversation is probably the most artfully staged scene in the film. It reveals the full nature of Tony’s diabolical plan and conscienceless character. His primary motivation for seeking his wife’s death is not over her infidelity but mainly for money – as a retired tennis professional, he has no means of supporting his now-accustomed luxuriant lifestyle, and upon his wife’s death he wiould inherit £90,000. Swann, who is equally unprincipled, accepts the offer. The next night Tony steals Margot’s latchkey to their apartment and places it under the stairway rug just outside the door for Swan’s entry later that night. There are some potentially disruptive hitches as things proceed, but these false alarms – Tony’s watch stops, a needed phone booth is occupied – add further tension and keep the viewer’s empathy with Tony. Swann enters their apartment on schedule while Margot is sleeping and hides behind the curtains, preparing to strangle Margot. But in the event Margot stabs Swann with a pair of scissors and kills him instead. Tony rushes home and, seeing his original plans dashed, adopts in a flash a new plan to kill off Margot and get hold of her money. Tony now has a new adversary, though, Chief Police Inspector Hubbard (played by John Williams, who also played this role in the Broadway production), who now becomes a major figure in the film. Tony’s new plan is to make his wife culpable of murdering Swann, and to do this he has to convince Hubbard. He proceeds to make it appear that Swann had been blackmailing Margot over the stolen love letter, and when Swann came to the apartment, she murdered him. In short order Margot is convicted of the murder and sentenced to death. Tony now seems to have gotten away with it. But the last section of the film concerns the various serendipitous events that serve to unravel Tony’s story. I won’t go into the details, but there are two key elements that drive the action. One of the elements is murder-mystery writer Mark’s supposedly cockamamy plan to save Margot. On the night before her scheduled execution, he approaches Tony with the idea that Tony confess to the admittedly fabricated idea that he had planned to murder his wife and had sent Swann to carry out the deed. Using his writer’s hat, Mark has come up with a murder plan that turns out by chance to have been the actual case. He tells Tony that though this “story” will be injurious to his reputation, it will save his wife’s life. Tony resists and when Mark persists, Tony convinces Hubbard that Mark’s story is ridiculous. This threat to Tony, which turns “truth” on its head, will undoubtedly intrigue the viewer. If Tony had been making preparations for the better part of a year, why did he wait until the night before the intended event to contact and negotiate with Swann? How could Tony be so sure Swann would agree to do it? It seems to me that Tony risked a lot by incriminating himself when he revealed everything to Swann, and his claims that he could cast guilt on Swann merely by getting his fingerprints on the love letter are not strong enough for him to take such a risk. Why was Tony so sure Swann was the person who could pull the murder off? Why was Tony so sure that there would be noone in the stairwell outside the apartment when Swann was to come and go? Although the probability would be low, one cannot take risks like that in such dire circumstances. There could also be sounds of struggle that might alert people in the vicinity. Tony’s claim that he had lost about a thousand pounds by losing bets at the dog races also seems weak and unlikely to be believed. And Tony’s later efforts after Swann’s death to get rid of his intended payoff money by making large cash payments to people he owed money to seems naive and almost guaranteed to invite suspicion. The impression that the super-confidant Tony gave in his Act 1 negotiation with Swann was that he had worked out everything perfectly after almost a year of planning. But the considerations above suggest to me that Tony’s plan was woefully ill-conceived from the start and fraught with risks. The acting performances were also variable. 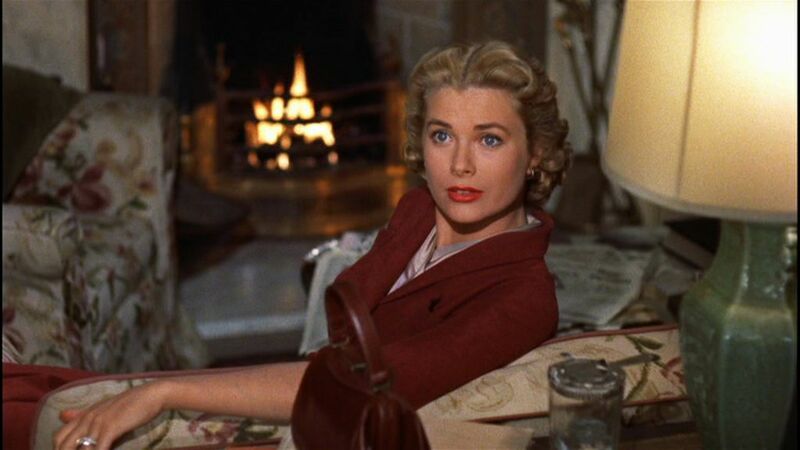 Grace Kelly, who really didn’t have a lot to do in this story, was radiant, as usual, and was convincing and effective. Her sometimes guilty, sometimes sympathetic glances were all important for the narrative movement. The other actors were mostly too theatrical for my tastes. This kind of posturing works better on the stage than with the intimacy of films. 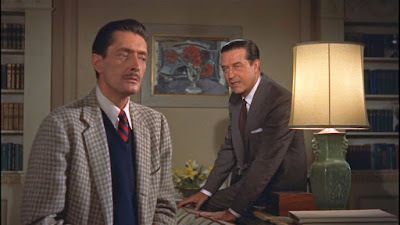 Ray Milland does reasonably well in the role of Tony, but the nature of that role is problematic. Hitchcock’s villains and adversaries are usually cold-blooded and unconscionable. Their cool implacability makes them even more frightening to us, because we cannot understand them. Although basically gentlemanly, Tony is like that, too. Only here we see things closing in on him from his perspective. This induces fear but not guilt. So our sympathies for him are limited. But Mark, and to a certain extent Margot, are not particularly sympathetic characters, either. And Inspector Hubbard seems to see everything as a gentleman’s game of billiards. At the end of the game, everyone pauses for a drink; and further disengagement takes over. This is perhaps why Hitchcock, himself, did not rate this film among his best. Rob Humanick, “Dial M for Murder”, Slant Magazine, (17 June 2011). Henry Barnes, “My favourite Hitchcock: Dial M for Murder”, The Guardian, (6 August 2012). David Bordwell, “DIAL M FOR MURDER: Hitchcock frets not at his narrow room”, Observations on Film Art, David Bordwell’s Website on Cinema, (7 September 2012). The Film Sufi, “Alfred Hitchcock”, The Film Sufi, (23 May 2009). The Film Sufi, “Notorious”, The Film Sufi, (19 February 2014). Remember reading somewhere that Hitchcock was once asked what was the best way to get away with murder. He replied "Do it with scissors" referencing the death of Swan in "Dial M for murder". Critic (afraid I can't remember the name) whose book the quote was in, pointed out that Hitchcock consistently got away with murder through the skill of his film editing. He did indeed "do it with scissors". This is a brilliant film... loved reading your review!